The Aluminum Series features an all-aluminum construction, all the way down to the stake pocket inserts. This provides a great corrosion resistant rack that features a great strength-to-weight ratio capable of holding 500 lbs of evenly distributed weight. Extruded aluminum cross bars make for an extremely strong bar with a lightweight design. They have a mounting channel on the top and bottom to make it easy to attach accessories like the ADARAC Load Dividers. Each Load Divider can hold 100 lbs, and four Load Dividers come with the Aluminum Series rack. With the uprights angled inward, this adds an incredibly sleek profile to match the cab of the truck. No excess bulk is added to the bed for a streamlined look. 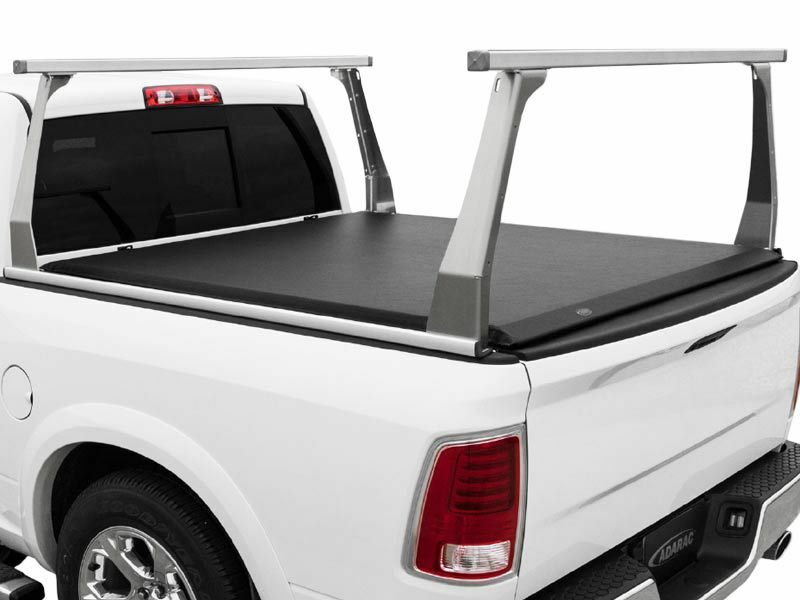 All Access Roll-Up tonneau covers work with this rack system, as well as most inside-the-bedcap tonneau covers. No special tools are needed to install the ADARAC Aluminum Series truck rack. Only a 9/16 wrench is needed to tighten down the mounting rails using the aluminum stake pocket inserts. Now, the aluminum uprights or optional ADARAC Tie Downs are easily attached to the mounting rails. The aluminum mounting rails have an extruded mounting channel along the inside that easily attaches the uprights or optional ADARAC Tie Downs. They can easily be removed or repositioned along the rail. The ADARAC Tie Downs are an optional accessory that mount to the inside of the ADARAC mounting rails. They hold 50 lbs each and are easily placed anywhere along the rails.